We are thrilled to be a part of Northern Virginia's most talked-about urban lifestyle center. City Sports, the Boston-based specialty sports retailer, today announced the opening of a new 10,000 square-foot store at Mosaic District, the bustling mixed-use lifestyle center located in Merrifield, VA, 15 miles from Washington, D.C. (2920 District Avenue, Fairfax, VA). The Grand Opening celebration for the new store will be held on Saturday, September 12th, with a full schedule of activities beginning at 9:00 a.m. The event will include complimentary refreshments, massages, entertainment, and $50,000 in prizes and giveaways, as well as grand opening deals across the entire store. The first 200 adults in line for the event will receive a backpack filled with prizes including City Sports T-shirts and mystery gift cards ranging in value from $10 to $200. * There will be a 3-mile Fun Run at 11:00 a.m. open to participants of all abilities. City Sports Mosaic marks the company’s 26th location, its seventh store in the Greater Washington area, and its first in Virginia. Located in the heart of Mosaic District, near the Angelika Film Center, the new City Sports store features a full range of athletic shoes and apparel, as well as equipment for everything from tennis and baseball to soccer and basketball. The store offers the latest in fitness technology products such as Fitbit® activity trackers and GoPro® cameras. A favorite of running, cycling, yoga, and fitness enthusiasts, City Sports carries the latest offerings from leading brands including Patagonia®, The North Face®, Nike®, ASICS®, and Under Armour®. The company is known for personalized services such as free gait analysis to help customers find the perfect pair of shoes, as well as complimentary tennis racquet stringing. The retailer hosts weekly run clubs at most of its store locations. The City Sports Mosaic store holds its weekly run club on Mondays at 6:30 p.m., rain or shine. Store employees, including former collegiate level runners, serve as pacers for 3- and 5-mile runs, offering training tips and advice for athletes of any ability. 9:00 a.m. – Doors open. The first 200 adults in line will receive a free City Sports backpack filled with prizes and mystery gift cards. 11:00 a.m. – Fun Run sponsored by Under Armour. All ages and abilities welcome! 9:00 a.m.-1:00 p.m. – Raffles will be held every half-hour for the chance to win a Fitbit, a GoPro, two $250 City Sports Gift Cards, and more. There will be complimentary massages, food and drink, music, and entertainment from the George Mason University Spirit Team. “We often say that City Sports associates are ‘athletes serving athletes.’ With deep product knowledge and extensive experience in their respective sports, our associates give our customers tailored advice on everything from running shoes to activity trackers to fitness apparel,” added Hanaka. *Visit http://www.citysports.com/Mosaic for Grand Opening event details. 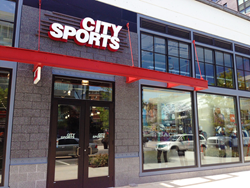 About City Sports: Founded in 1983, City Sports operates 26 retail stores in metropolitan locations in Massachusetts, Rhode Island, New York, Pennsylvania, Maryland, New Jersey, and Vermont, as well as seven locations in the Greater Washington Area, including Georgetown, Gallery Place, 19th Street, Silver Spring, Bethesda, and Rockville, and Fairfax. City Sports offers performance footwear, apparel, and equipment for running, fitness, swimming, cycling, tennis, team sports, and more. The company carries a comprehensive assortment from leading brands including Under Armour, Nike, Patagonia, The North Face, Fitbit, ASICS, and adidas, as well as niche specialty brands and their own CS by City Sports label. More information: http://www.citysports.com.